Lately, the chaos of the new school year has left me daydreaming about summer vacation. What I wouldn’t give for just a few days at the ocean with the kids, watching them jump over gentle waves as I lounge in a chair and carelessly make sand figure eights with my toes. There is just something about the crash of the ocean mixed with mild temperatures and gentle breezes that relaxes my mind and renews my soul. As most of the country is experiencing a dip in the temperatures, La Jolla, a seaside town just north of San Diego, is set to enjoy another endless summer. 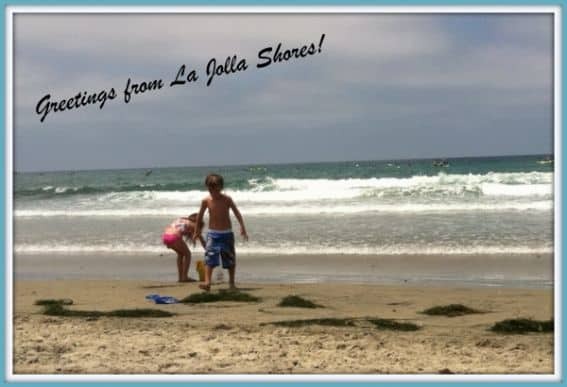 California may have over 800 miles of coastline, but there are relatively few hotels that sit directly on the sand like the La Jolla Beach and Tennis Club (LJBTC) and its sister property next door, La Jolla Shores Hotel. LJBTC may be a private and exclusive club that has an extensive waiting list for membership, but us common folk can indulge in all of its amenities while staying in one of its comfortable beachfront suites. 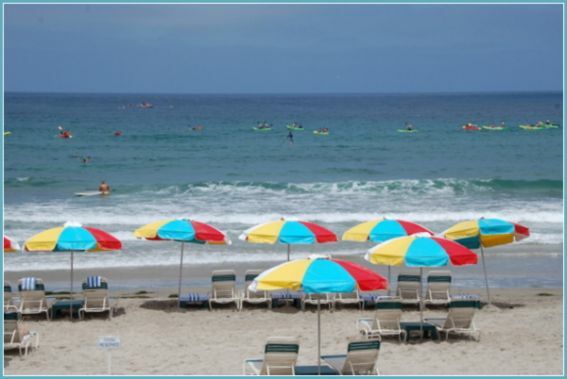 This past summer my family had the opportunity to spend a couple days waking up to the sounds of surf hitting the sand as we lazily watched beach boys set up cheerful umbrellas and comfy lounge chairs on the club’s private stretch of beach. Whether we made breakfast in our spacious ocean view suite or made our way downstairs for a hearty poolside breakfast of huevos rancheros (delish! ), we embraced the casual beach atmosphere and moved through our day at a slow and relaxing pace. Beach life in La Jolla is so zen that I witnessed a sea gull doing tai chi on the top of the roof of the La Jolla Beach and Tennis Club. That’s right, I am fairly confident the bird waxed on, waxed off, and then moved into the crane position. Who can blame him? It is hard not to feel centered while watching kayakers glide on a silvery sea. Instead of climbing up onto the Club’s red tile roof and joining the meditative gull, I decided to take in my surroundings while helping my kids dig for dozens of sand crabs using the Beach Club’s sand toys. The ocean here is rich with sea life and the La Jolla Ecological Reserve sits right off shore, protecting 533 acres of marine habitat. 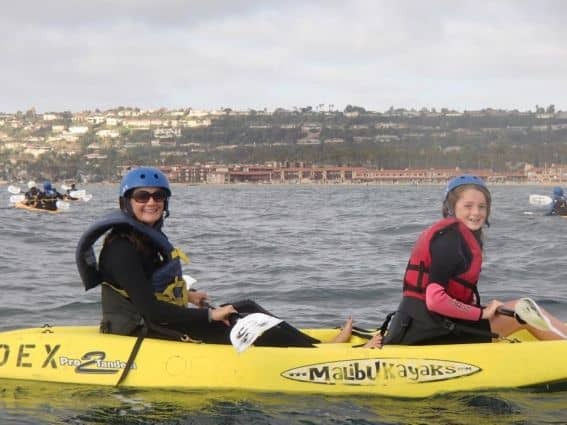 One of the most popular ways to explore the La Jolla Ecological Reserve is by kayak. Though the surf is quite mellow, first timers- especially first timers with young kids- will want to head out to explore the cove with a guide. OEX Dive and Kayak has been operating tours of the reserve since 1995, taking adults as well as children on a kayaking experience they won’t soon forget. The most popular tour is the Original Sea Cave Tour which takes kayakers on a 90-minute paddle across the preserve to the famous La Jolla sea caves. If the surf is calm, paddlers have a chance to enter Emerald Sea Cave. The water was a bit too choppy the day my family took our sea kayaking tour, but my kids were happy spotting fish, sea lions, and the occasional magical jumping dolphin only visible to five-year-olds. La Jolla is home to more (harmless) leopard sharks than anywhere else in the world and during the late summer and early fall the cove waters are filled with these beautiful creatures. Since we didn’t spot any during our trip, my son has made me promise to teach him how to snorkel so that we can swim with the “nice” sharks together. My kind of kid! If you can manage to pull your family away from the beach to explore the grounds, you will quickly see that the club has much more to offer its guests than a gorgeous stretch of sand. Young children will appreciate the playground and toddler pool while older kids (and adults who love to play) will enjoy the 9-hole pitch-and-put course as well as the beautiful pool which is always heated to a warm 83 degrees. Since LJBTC is a tennis club, it is no wonder that its tennis facilities and instruction are top notch. 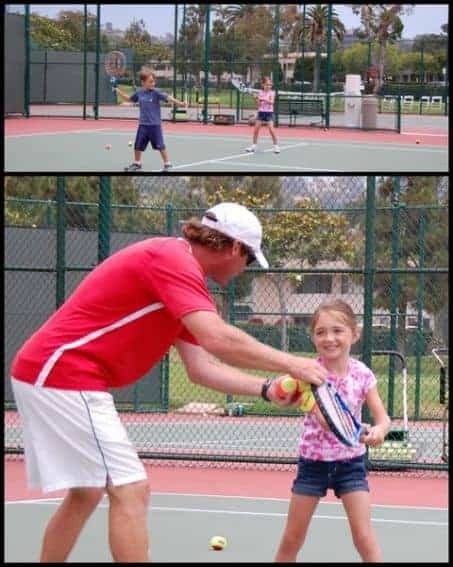 My children had a blast during their tennis lesson with a pro who definitely knew how to keep kids focused, learning, and having a great time all at once. Visiting families can set up lessons, join clinics, or just reserve a court and have fun on their own. Just because your family is ready to head back to the sand, doesn’t mean you have to put down your rackets. Beach tennis- a cross between badminton, volleyball, and tennis- is a growing sport and complimentary equipment rentals are offered. No great getaway is complete without a great meal. Couples visiting La Jolla Beach and Tennis Club will definitely find a meal to remember at the Marine Room, the club’s upscale surf-front restaurant. Families, on the other hand, will be much more comfortable at The Shores Restaurant. The beachfront dining at this restaurant is very casual (feel free to wear flips flops and shorts) but the food is definitely not basic burger and fries. Everything from Lavendar Honey Glazed Pork Chops to Black Pepper Crusted Albacore can be found on the adult dinner menu. Kids will be relieved to know that all their favorites such as chicken tenders and hot dogs, as well as healthy options like grilled chicken, can be found on their menu. If you eat one meal at La Jolla Beach and Tennis Club, make it yourself! Yes, the food inside the restaurants is great but the beach barbeque experience is spectacular. 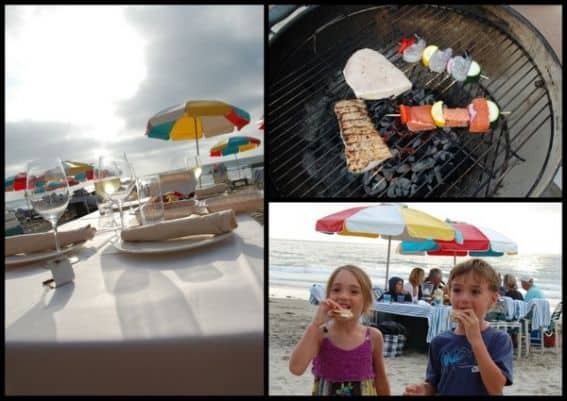 For only $25, guests can rent a barbeque, utensils, table, and up to ten chairs which will be set up right on the sand at dinner time. Food can be selected from a beach cookout shopping list featuring everything from swordfish to hot dogs, or bring in your own food. It seems as though the tradition is for barbequers to bring something to spruce up the table, and I was a bit envious of the personalized table settings with fresh flower bouquets that those in the know used as centerpieces. Luckily, I had the setting sun, smell of the fire, a glass of wine, and the company of those I love to remind me that I didn’t need a pretty place setting to have perfection. But I do need s’mores. Luckily, we brought those. Disclosure: The author visited La Jolla Beach and Tennis Club for a media stay. Room and dining was provided so that the author could write this blog post as well as an unbiased review. This author really appreciates the hospitality but her story is unbiased because, hey- that’s her job!